The first full year in South Florida was both hectic and rewarding for Al Capone. While he continued to conduct business in Chicago, Capone was beginning to set roots in Miami. This idea made many of the prominent South Floridians very uncomfortable. The same leaders that were involved in legitimate business, were also very involved with the sorts of activities that had earned Capone the distinction of being public enemy number one. Illegal gambling operations and sale of alcohol to the tourists were deemed okay as long as they were provided by the current establishment. Prominent men such as Carl Fisher, Everest Sewell, James Cox and many others were comfortable living outside the law when it came to matters of indulgence. However, they were not comfortable with allowing the “syndicate” to take root in their community and begin to change the balance of power and disrupt the rhythm of indiscretion in Miami and Miami Beach. Prior to Capone’s arrival, there was a certain harmony to how Miami and the beach operated when it came to the illegal vices of the day. With the exception of the first half of January in 1929, Al Capone was enjoying his first year in his Palm Island home. At the turn of the year, Capone was bed ridden with what started as influenza and then progressed to double pneumonia. Although the exact dates of his incapacitation would be later be questioned, Capone was not seen around town until the second week of January. Once Capone felt well enough to leave his home, he would begin to enjoy the amenities of living in South Florida. 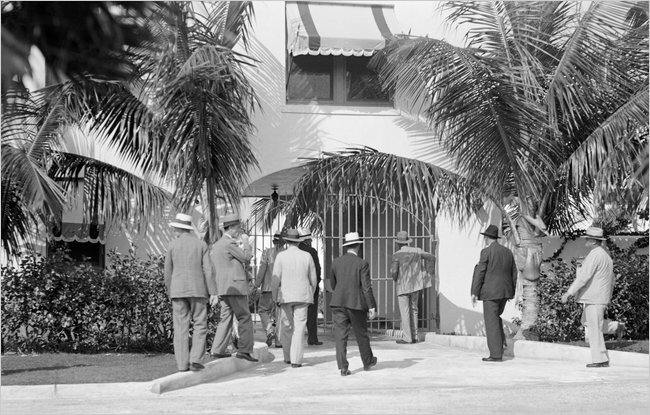 Capone was routinely spotted at the Miami Jockey Club in Hialeah to watch the horse races. As was uncovered during his contempt of court hearing in June of 1931, Capone was spotted by several local law enforcement officials, in good health, attending races at the race track between January 13th and March 5th of 1929. On February 2nd of 1929, Capone chartered a plane to fly himself and some friends to Bimini for a picnic. Charter Captain Edward Nirmaier was quoted as saying that he charged Capone $150 and was tipped another $100 for a trip to enjoy salami sandwiches and drink beer. Capone also enjoyed a longer vacation, by steamer, to the Bahamas from February 8th through the 12th. Capone’s vacations would later be used against him when he petitioned a Chicago court for postponement of a hearing he was subpoenaed to appear on March 12th, 1929. He waited until March 11th to ask for postponement and said he was too sick to appear in court. On March 27th, 1929, Capone was cited by the federal court in Chicago for contempt of court. He was arrested and released on $5000 bond. It would take two years before Capone would be tried for this contempt of court charge. It was said that Capone did enjoy playing golf and tennis while he was in South Florida. He wasn’t very good at either. However, that didn’t keep him from displaying his famous temper when things didn’t go well at either sport. Capone was very well known for his dinner parties and all day card games. Jack Sewell, son of Miami Pioneer John Sewell, recalled walking into Capone’s home during a poker game and seeing nothing but $1000 bills on the table. After Sewell arrived, Capone turned to him and said “I’m out, these scoundrels have taken me for $250,000”. There was even an urban legend that, while president-elect Herbert Hoover was staying at JC Penney’s home on Belle Island in January of 1929, Capone’s loud parties on Palm Island disturbed Hoover’s stay in Miami Beach. The legend went on to say that, because Capone disrupted what was to be a quiet vacation, Hoover made getting Capone a priority during his first term as president. However, none of Capone’s biographers have found any evidence that Hoover’s policies relating to Capone had anything to do with his vacation on Belle Island in 1929. While there were plenty of people in Miami wanting Capone to leave the area, there were also a number of prominent Miamian’s that were happy to associate either with the man or his money. Prior to the Frankie Yale murder investigation, Parker Henderson Jr. would show Capone around Miami and make introductions. Henderson brought Capone into Sewell Brother’s Store on East Flagler and introduced him to Jack Sewell. As mentioned earlier, Jack was the son of John Sewell and nephew to Everest Sewell. At their first meeting, Capone purchased $1000 worth of suits, shirts, underwear, ties by the handful, shoes and socks from the store. Jack gave Capone a new belt and a Panama hat as a thank you for his purchase. Capone asked to shake Jack’s hand, saying, “This is the first time anybody ever gave me anything”. Capone would continue to shop at Sewell Brothers and would develop a friendship with Jack. Jack’s father was aware that Capone was shopping at the family store, but his uncle was not. Everest Sewell was once the president of the Miami Chamber of Commerce and was a multi-term Mayor of Miami. He was one of the people who was trying to run Capone out of town. Later, Everest was made aware of Jack’s dealings with Capone and he was not amused. During vagrancy proceedings against Capone, Everest had to admit that he was fully aware of Capone’s lavish Sewell Brother’s patronage. In addition to Parker and Sewell, Capone was solicited by another prominent son of Miami, Roddy Burdine. Roddy was the merchandising prince of the Burdines Department Store. He was a very prominent member of the business community and the director of the Community Chest. On March 6th of 1929, Burdine went to Capone’s Palm Island home to ask for a contribution for the Community Chest. He was greeted by Capone and offered Champagne. They had a two hour chat which concluded with Capone giving him a check for $1,000 and a strong hint that quid pro quo was in order. Capone wanted Burdine to arrange a party for him and his friends at a local country club in order to meet influential people to ultimately ensure membership into the club. The party never happened and ultimately Burdine had to return the check due to objections from the rest of the Community Chest on the source of the contribution. While he may not have had the ownership interest in as many South Florida illegal operations as urban legends allude, Al Capone did invest in Miami and Miami Beach’s gambling and drinking establishments. Based on surveillance done by Carl Fisher’s security manager, Michael Glenn, there was confirmation that Capone had financial interest in several prominent operations on the beach. 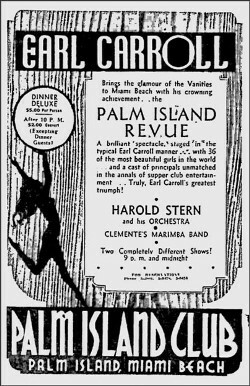 When the Palm Island Club changed ownership in January of 1930, Capone managed to gain one-fourth interest for which he paid $25,000 to the new ownership group. The Palm Island Club was a well-known establishment for illegal gambling and booze consumption. Glenn also confirmed that Capone had a one-fourth interest in the Floridian Hotel gambling room, in which his men installed crooked gambling devices. The Floridian Hotel, located on Miami Beach just north of the County Causeway (later named the MacArthur Causeway), used to be the location of James Allison’s Aquarium. The location was no stranger to attention from the federal authorities. It was raided in 1921 for violation of prohibition. James Allison’s private stash was confiscated. The hotel was later renamed Biscaya and it was demolished in 1987. Glenn also confirmed Capone’s controlling interest in the South Beach dog track, Carter’s gambling house, as well as, Albert Bouche’s Villa Venice. Villa Venice took over the location of the Ocean Beach Casino and was named and styled after Albert Bouche’s famous location by the same name in Chicago. It opened on New Year’s Eve in 1929. Villa Venice Miami Beach location was still in business on the beach as late as 1945. The South Beach dog track was the Miami Beach Kennel Club. It opened in January of 1929 and was managed by a colorful character named George R.K. Carter. Carter was arrested on November 12th, 1927 for choking the editor and publisher of the Miami Beach Beacon. The paper had published an editorial outlining Carter’s involvement in running an illegal gambling house on the second floor of the Lummus Building (Ocean Beach Realty Office). 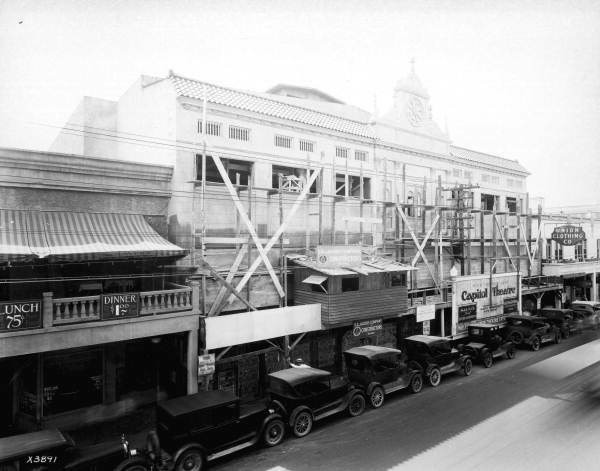 This place was located at the corner of Ocean Drive and Biscayne Street and was the same building where the town of Miami Beach was incorporated in 1915. This gambling den was referred to as Carter’s gambling house. It isn’t clear when Capone got involved with the gambling operation, but it was operating prior to Capone arriving in South Florida. 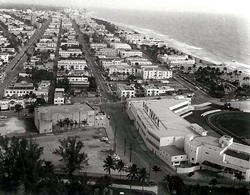 The Miami Beach Kennel Club remained opened for 51 years until it closed in 1980. Not all of Capone’s efforts to gain control over Miami Beach establishments were successful. Capone tried to work his way into owning the Deauville Casino, but he was refused. Shortly thereafter a number of men were brought down from New York for protection from Capone and his men. Glenn also listed politicians that had been paid by Capone and his gang. He listed a state representative and a Miami Beach city manager. In his auto-biography entitled “Journey Through My Years”, James Cox, editor of the Miami News, claimed that it was well established that Capone donated $30,000 to one candidate for office. In addition to being concerned about what Capone’s presence meant for the community, South Florida’s civic leaders were as much concerned about what it meant for their own activities. It was very clear that Carl Fisher and his friends were “knee-deep” in illegal activities including movement of illegal liquor and complicity of illegal gambling operations. Fisher and friend’s campaign against Capone was as much for self-preservation as it was for common decency and community safety. At roughly 10:30am Central Standard Time, on a cold blistery February day in Chicago, a sedan pulled up to 2122 North Clark Street and several men, some dressed as police officers, got out and entered the building. After several minutes of gun fire, the men dressed as police officers left the building with others apparently in custody. The sedan drove away. The arrest was a mock arrest and by the time the real police arrived they found seven men dead. 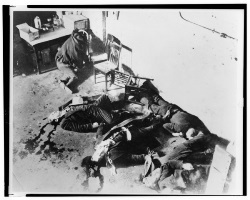 The men were executed by tommy guns while facing a back wall. What was labeled as the Saint Valentine’s Day Massacre was setup to take out one of Capone’s enemies, George “Bugs” Moran. Moran was late to what was to be a purchase of stolen booze from free-lance hijackers. Moran got close to his garage, which doubled as a warehouse, when he noticed what he thought was a raid. He left and dodged certain death. Moran was an enemy of Capone and was partly responsible for the death of one of his friends a month earlier. Later, an enduring legend had George Moran stating that “only Capone’s gang kills like that”, when commenting on the massacre. Meanwhile, at 11:00am Eastern Standard Time, Al Capone was up and about at his Palm Island home. He had a 12:30pm meeting at the Dade County Courthouse in downtown Miami. Right on time, Capone pulled up to the Court House in a light blue colored limousine. Capone stepped out of the car in a tropical checkered sports jacket, white flannel trousers, sport shoes and his trademark white fedora. He arrived with two bodyguards, one remained with the car and the other accompanied him to the court house. Capone was to meet with Robert Taylor, the Dade County Solicitor, and Louis Goldstein, an assistant district attorney from New York. Capone had met with Taylor during the summer of 1928 regarding his knowledge of the Yale murder. The purpose of this meeting was to ask some additional questions following Parker Henderson’s testimony. Most of the questions surrounded Capone’s business, business associates and friends. Capone found the questions peculiar and off topic. His answers to some of the questions asked in this meeting would later be used to help build the case for income tax evasion against Capone. When the meeting concluded, Capone couldn’t help but feel good about the government providing him with an air tight alibi for the events that occurred in Chicago on that day. Life would appear to be very good for Al Capone. He continued to enjoy his time in Miami. On February 16th, 1929, Capone hosted a large party at his home as part of the fanfare surrounding the championship fight between Jack Sharkey and William “Young” Stribling. 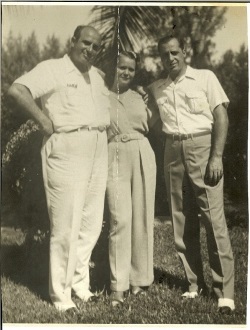 He visited the camp of Sharkey and got a picture of himself between the two fighters. He later played golf at the Hollywood Country Club. On February 27th, 1929, the Sharkey v. Stribling fight took place at the Pine Board Arena in Flamingo Park on Miami Beach in front of 30,000 boxing fans. Sharkey won a decision over Stribling in ten rounds. Earlier in the day, Capone was served a subpoena to appear in Chicago about Prohibition violations in Chicago Heights for March 12th, 1929. It was this subpoena that he tried to postpone on March 11th and was later cited for contempt of court for lying about his reasons for requesting postponement. By early May of 1929, there was a lot of fall out and concern around the Saint Valentines Massacre. The police did not have any solid leads or reliable witnesses, and the organized crime families were worried about unwanted attention to their business operations. It was clear that there needed to be a negotiation to champion cooperation and better harmony between all families. A conference was called for May 13th through May 16th in 1929. It was believed that the conference was called by Frank Costello. 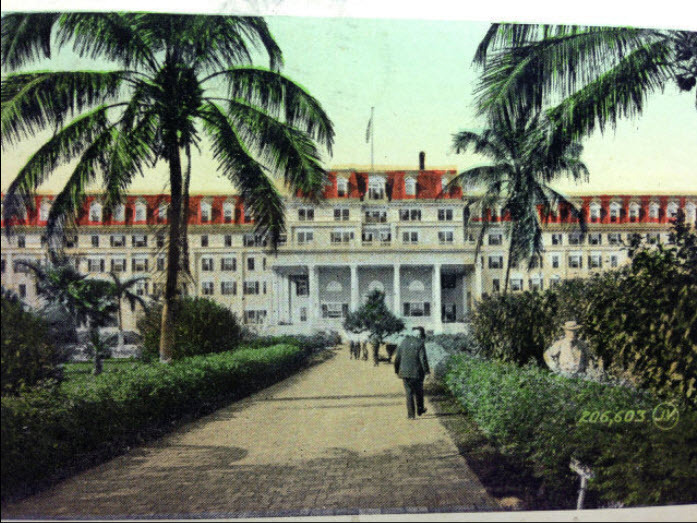 The conference was hosted by Enoch “Nucky” Johnson at the President Hotel in Atlantic City. Nearly every important crime figure from the East Coast and Midwest were in attendance, regardless of race or creed. According to Robert Schoenberg’s biography of Capone, the attendees included: Frank Costello, Meyer Lansky, Charles Luciano and Dutch Schultz from New York; Charles Solomon from Boston; Abner Zwillman, overload of New Jersey; Abe Bernstein from Detroit’s Purple Gang; Max Hoff, kingpin of Philadelphia; and others from Florida and New Orleans. All factions from Chicago made the conference with the exception of George Moran. Capone brought with him Jack Guzik, Frank Nitti and Frank Rio. Al Capone took the floor with an impassioned speech about how there is enough business to make everyone rich. He further called for the killing to stop and to forget the past and look toward a brighter future. 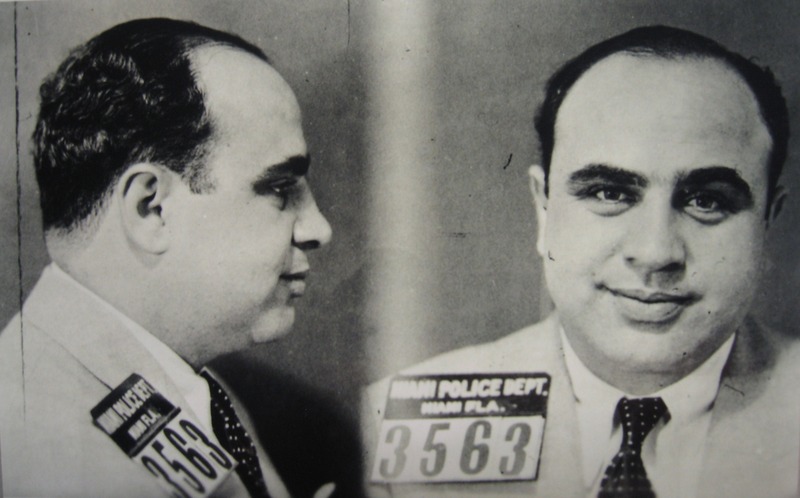 Based on the outcome of the meeting, each member of the convention signed an agreement to follow the vision that Capone outlined. This conference was later known as the “Atlantic City Conference” and was considered by many historians as the earliest organized crime summit. At the conclusion of the meeting, Capone knew that Moran would still be in waiting to get revenge. Whether it was his own idea, or at the suggestion of Johnny Torrio, Capone decided to remove himself for a short period of time to let things cool down in Chicago and to remove himself as the target of public outcry for the violence in Chicago. Capone left the conference with Frank Rio and two bodyguards on May 16th. The four men headed for Philadelphia by car to catch a train back to Chicago. Due to mechanical trouble with the car, the four men missed their intended train to Chicago. They bought tickets for a later train and had time to kill. They decided to attend a movie at the Stanley Theater on Nineteenth Street. As the men entered the theater, two detectives recognized Capone. About 8:15pm, Capone and Rio stepped out of the movie theater and the detectives, while waiting for backup, approached the two men and showed their shield. Both Capone and Rio volunteered their weapons and were quietly arrested by the detectives. The two bodyguards slipped out of the theater blending in with the exiting theater crowd. Capone and Rio were arraigned and charged with “being suspicious characters and carrying concealed deadly weapons”. Capone and Rio both pleaded guilty and the judge sentenced the men to a year in prison. While it was widely believed that Capone’s arrest was setup to get out of the public eye for a while, it was clear that he didn’t expect to get such a lengthy sentence. He was disappointed at the judge’s decision to give him the maximum sentence for his crimes. Capone and Rio were sentenced on May 17th, 1929 and would remain in jail until March of 1930. Both men were originally jailed in county facilities, but they were later moved to a state prison. As Capone was approaching the end of his prison term, there was a lot of anticipation on where he would settle once he was released. The authorities in Chicago were very clear that he would be arrested on site. The governor, law enforcement and civic leaders in Florida were also ready to make life very difficult for Capone if he chose to come back to his Palm Island home. “Capone in Miami – Part 3” will outline Capone’s release from the Pennsylvania prison and South Florida’s effort to make him feel unwelcome. Please read “Capone in Miami – Part 1” for the story of how Al Capone arrived in Miami and purchased his home on Palm Island. Tequesta: “Judge Vincent Giblin The Life and Times of a South Florida Attorney and Judge”, William G. Crawford Jr., Number LXX (2010). 7 Comments on "Al Capone in Miami – Part 2 of 4"
I’m LOVING your reporting on this, thanks so much for the amazing history lesson! Enoch “Nucky” Thompson is a fictional character from HBO’s Boardwalk Empire TV Series. You must have meant to put Enoch Lewis “Nucky” Johnson?? Thank you, Stavros. I must have been influenced by the show Boardwalk Empire. I actually had the right name in my notes. Thanks again! Hi, Karen. I sent your an e-mail regarding your question about the photo caption. I am not sure if you received it?